For those of you who don't know, Mike's birthday is on December 28th. I always try to do something special for him on his birthday since it is so close to Christmas. I want him to feel like he had a special day. Since we would be traveling on his actual birthday, I planned to celebrate a day early at the Organ Family Christmas. Easton trying to help Mike blow out the "never ending flame" candles. I had heard of the candles before but had never seen how they actually work. Let me just say... fire hazard. The concept is really fun but then when it is actually time to really put them out panic started to set in. The whole clan (minus Amy who is taking the picture-thanks). Not only is this as close to a group shot that we got all holiday season, but this picture was intended to show that while everyone was enjoying Superman cake and ice cream, Phil decided he wanted seconds of roast and gravy. Oh, one last thing. When it was time to serve the cake our cute little nephew didn't skip a beat before he announced he wanted to eat Mike's head and we let him. Happy Birthday Mike- I Love You! This is what happens when you have a goofy family and a wireless camera remote...Enjoy! The Organ Family Christmas (minus David & Belinda- we missed you guys) took place the Saturday night after Christmas. Mike and I always love getting to spend quality time with family. This year we did our traditional Christmas get together. We opened presents, one at a time, everyone must see what the others received. Then we had a very nice dinner. I really enjoyed watching Easton open his presents this year. He was so excited about everything he got and he was so patient while the others took their turn opening their presents. Phil & Easton playing Santa. I don't know why we never get a family shot when the Organ clan is together. I am going to have to make a mental note to take time to do that next year. We are so thankful for everything we received that night and we are very blessed to have such great families. Mike and I had another wonderful Christmas. We really enjoyed getting to spend time with both families. We spent Christmas Eve and Day with my family and celebrated Christmas with the Organ Family later in the week when Phil, Amy, & Easton could make it. This was one of the presents my sister gave my brother. She went to his apartment one day to visit and went to use the bathroom and there wasn't any toilet paper. You've gotta love Bachelor Living! A surprise gift from Mike! Thanks BJ a Bible and a beer koozie! This picture was taken because everyone got Christmas socks in their stockings, so my sister thought we needed to show them off. Mom & Dad Organ came over for lupper (being that we ate at 3:00 not sure if that would be considered lunch or supper) and games. Thanks everyone for such a great time! I hope everyone has had a wonderful holiday season. I know I'm behind on posting all of our Christmas events, but the rest are coming. One of the things I look most forward to at Christmas is giving gifts to others. I get most excited when I have found that perfect gift knowing whoever I'm getting it for will absolutely love it. I thought this year I would do things a little different and make something for everyone. Well to make a long story short only 3 out of the 13 people received something homemade. For various reasons my plan never came to fruition, but I did decide to make both Moms and my sister something. My sister was recently accepted to join Delta Gamma Rho, a club/sorority at Harding University. So I made her a set of towels and a book bag/purse in her club colors. I found this really cute apron pattern at Joanne's and that is what I decided to make for both of the Moms. Last year I bought myself a sewing machine for my birthday. I had never sewn anything in my life, but I knew I wanted to learn. I figured the best way to do that was to jump in head first. The funny thing is that after I got the sewing machine it sat in its box for probably 4 months before I even pulled it out. I was too scared to use it. One day I decided it was time to face my fears and sew something. I thought it was a good idea to start small and sew Martini a blanket. I would use fleece so all I would have to do is turn the edges under and sew a straight stitch. I think I sewed Martini 2 or 3 blankets over a few weeks which gave me plenty of practice. I quickly learned how the machine worked and it gave me confidence to move on to my next project. So a few months before Christmas it was time to start working on the presents for the women. The aprons were my first project. With a little coaching from my friend Rebekah (thanks a ton) I was ready to get started. At first the task was a little daunting, but I took my time and did about 2 steps from the pattern each day. Knowing that once I finished the first apron, the rest shouldn't be too hard. Google search was my friend through out the process. If I came upon a stitch I didn't know or a word I wasn't familiar with I simply googled it. And there my answer was, usually accompanied by a video . So I pretty much had my own private teacher. The first apron took me a couple weeks. After I got it done, the others were finished in a matter of days. BJ's towels and bag were a whole different story. Since I store bought the navy towels, I thought it would be a piece of cake, WRONG! I didn't have a pattern for the letters, so I had to make my own. Then I didn't realize how hard working with cut terry cloth is, but like they say on Project Runway (my favorite show) "Make it Work" and I did. The process in all was very simple, although the letters did required a lot of attention. As for the bag, I chose this particular bag pattern because it was a "see and sew" pattern, meaning it was supposed to be one of the easiest patterns. Overall it was, I had it finished in one Saturday. But it was the same old story... brand new pattern + brand new sewer + monogramming letters = many hair pulling moments. This past Saturday night was our annual Life Group Christmas Party. Over the past few years we have done Progressive Dinners, but this year we decided to do things a little different. Instead of all the ladies cooking we decided to eat at Park Cafe for dinner. The food was excellent, but we were missing two members of our group. Kyle and Janna missed dinner because Kyle was home sick. Luckily Janna was able to join us later. We missed you Kyle! After dinner we all headed to our house for dessert and Dirty Santa. Here are some pictures from Saturday night. Since we were all having so much fun we forgot to get a group picture. We did how ever manage to get a picture of the girls. 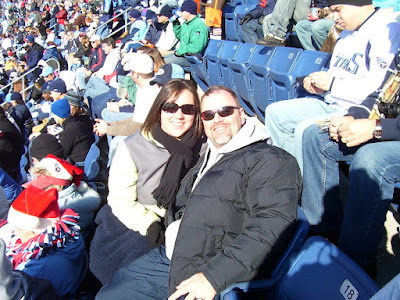 Last Sunday Mike and I bundled up to go cheer on our Tennessee Titans. It was really cold, but it was so worth it...we won! 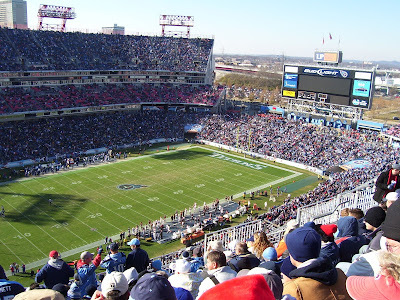 The Titans have had a really great season. As of today they are 12-2 and we have definitely made it into the playoffs. We have really enjoyed being season ticket holders. As long as it isn't raining it makes for a fun Sunday afternoon. Since I'm already doing a post on football I want to add one more picture. Mike emailed me this picture several weeks ago. I just thought he wanted me to see how much fun everyone had at the Monday night football game. But no, he sent it to me because he wanted me to post it on our blog. The only problem was that he forgot I can't read his mind:) So while he was looking through the blog a few days ago and asked where his MNF picture was. Sorry honey. I guess it's better late than never. 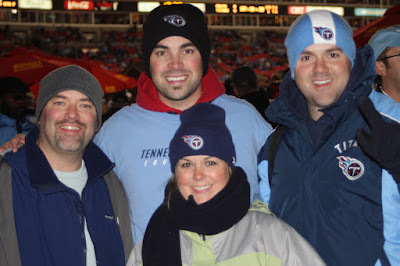 In the picture is Mike, Phil, and our friends Brian and Ashley. While the four of them were freezing in the 30 degree weather. I was nice and toasty at home watching the game with my mother-in-law. Just looking at this picture makes me shiver.